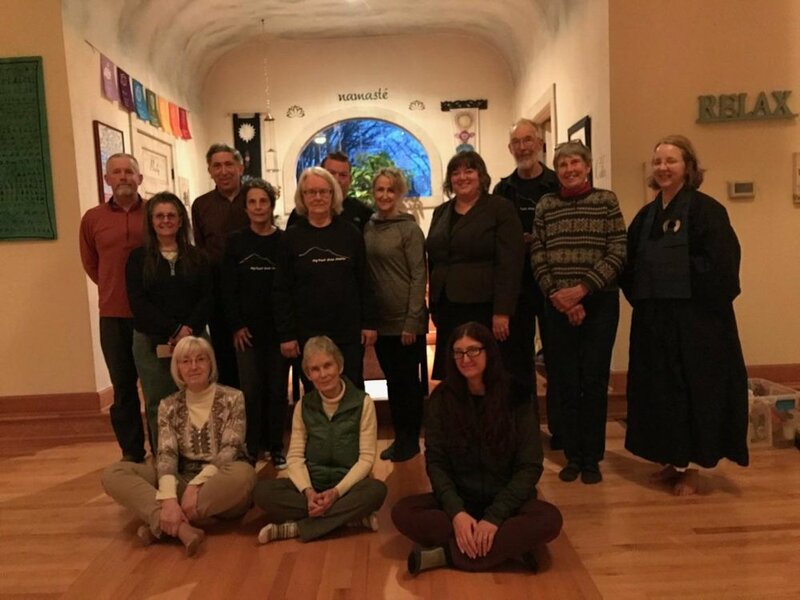 Wy’East Zen Center welcomes you! we deeply respect the curiosity and courage it takes to do something new for the first time. We want you to know that whether it’s your first experience with Buddhism or you are an experienced practitioner, whether you are part of another spiritual tradition, whether or not your path includes a deity or higher power, you are warmly welcome. You will encounter some bells, bowing, chanting, incense lighting, and other practices that might be unfamiliar. Don’t feel like you’re expected to know any of these “forms”. As we used to say in the ‘60’s, “Get in where you fit in.” If you enjoy chanting, please join in! If not, it’s fine to just read along (you’ll be told what page in the chant book to turn to). Most of us learned by copying others in the meditation hall and asking questions. Always feel free to ask! If you want to learn more about how we do things before coming please see our Beginners’ Guide to WEZC forms. Wear something comfortable. You will be sitting still either on a cushion or in a chair for up to 30 minutes at a time. That is not to say you can’t move - position adjustments are to be expected, especially at first. Wear something that doesn’t restrict your breathing or your posture. Shoes are left in the entryway. Socks are fine. Our meditation space may be chilly or warm depending on the season so dress for comfort. When to arrive: THIS is our regular Wednesday schedule. Come for all or any part of our Wednesday evening meetings and participate in whatever aspect of our program meets your needs. On your first visit it’s a good idea to come 20-30 minutes early to have a look around. Someone will always be available to give you a brief orientation. If you arrive after meditation has begun, just remove your shoes, enter quietly and take any seat facing the wall. Where to sit: Cushions (zafus), benches (seizas) and chairs are provided. You may sit anywhere unless there is a “reserved” sign on a spot. Forms are what we call the structured ways that we do things in the Soto Zen tradition. There are lots of them, and nobody has ever done all of them perfectly. Please don’t let anxiety over the forms be an obstacle to exploring what our tradition has to offer. None of us were born knowing them. We all sometimes forget them or do them “wrong” and none of us know all of them. We each feel differently about the forms at different times. Sometimes we respect and rely on them, other times we want to throw them all out the window. Be nice to yourself around the observance of the forms and don’t worry about memorizing them or “looking silly”. Our forms are adapted from Dharma Rain Zen Center. Here is DRZC’s description of some of the forms observed in the meditation hall. Questions? Feel free to contact one of our teachers or email info@wyeastzencenter.org. There is no expectation that you are a Buddhist or aspire to be a Buddhist in order to participate in our practice. Wherever you are on your spiritual path, you are warmly welcome to Wy’East Zen Center.